The 14 Days Everest Base Camp trek reaches a high point of 5545m Kalapathar, a small peak offering superb views of Mount Everest and other Himalayas. Everest base camp trek is a dream of any avid adventurer, but just because you are not climbing Mount Everest, do not think that the hike to Everest Base Camp (EBC) is an easy undertaking. It’s so tough that at times you question your sanity and why you ever decided to do it. At other times you look at the scenery that’s so breathtakingly stunning and unlike any mountainous terrain that you have ever seen before – changing from lush green farmland, dense forest and glistening blue fast flowing rivers to barren land and glacial pools the higher you climb – that you realise it was a good decision. Naturally, Everest Base Camp makes the list as one of the best treks in Nepal. Due to its popularity, the trail can get a bit crowded during the peak climbing seasons, nonetheless, it is still rather magnificent to conquer as you stand face to face with the world’s tallest mountain. The Sherpa culture is one of the highlights of this trek, making the whole thing a cultural experience. Let the expert guides at Nepal Tours lead you to sensational mountain views and give you local insight into Sherpa culture. We boast 99% success rate to date on our Everest base camp trek, this is achieved by adding in one extra day in the critical acclimatization period and helping clients come physically prepared. Kathmandu, Lukla, Namche, Everest Base Camp, Kalapatar. Everest’s daunting summit soars so high that trekking to its base camp (17,590′) is still an adventure of the highest sort. Join Nepal Tours on a 14-day Himalayan Classic Trek to Everest’s Southern Face Base Camp through some of the world’s most spectacular mountain scenery. How difficult is the Everest base camp trek ? If it were not for the altitude, the Everest base camp trek would be considered fairly moderate. However, when you take the altitude into consideration, the trek becomes quite difficult. On average you will be trekking 5 or 6 hours per day and you will need a good level of fitness. With some basic training we believe the EBC trek is achievable for most people. WHAT IS THE SCENERY LIKE ON THE EVEREST BASE CAMP TREK? Rivers, valleys, forests, suspension bridges, monasteries, Nepalese villages and, of course, hugely tall mountains make up most of the beautiful scenery on this trek. WHEN IS THE BEST TIME TO HIKE THE EVEREST BASE CAMP TREK? The best time to trek Everest Base Camp is during the warmer and drier months from September to November and March through to late May. I’ve Never Trekked Before. Can I Do the Everest Base Camp Trek? Before committing to at least eleven days hiking in (generally) basic conditions, it’s a good idea to establish that you like hiking and don’t mind basic conditions, so that you can actually enjoy the experience when you do it. Bank a two- or, optimally, three-day hike to see how you feel about walking each day and being away from home comforts before you commit. How Should I Prepare for the Everest Base Camp Trek? The Everest Base Camp trek is less physically strenuous than some people make out – although not a walk in the park. The main issue is going up and down steep slopes and steps, and so the best preparation is to go up and down lots and lots of stairs with the weight that you’ll be carrying when you trek. Is the Everest Base Camp Trek Dangerous? The first rule of trekking Everest Base Camp is to step to the wall side when you meet a yak or mule train, since otherwise you can be knocked off the edge. The straight-in, straight-out route, though, is relatively danger-free: the path has been widened and in many places smoothed for trekkers, especially where it traces a sheer slope. The main danger for most people doing the straight-in, straight-out route is altitude sickness (AKA Acute Mountain Sickness or AMS). For most people, this can be avoided by sleeping no more than 300 metres higher than you did the night before and taking an acclimatisation day every 1000 metres. Serious AMS is more common in folk doing group tours than in independent trekkers. Other common injuries are twisted ankles and sprains. Rock falls, moraine and glacier crossings add significant risk to longer treks involving crossing high passes such as the Cho-La. As always, it’s unwise to trek solo in case you fall and can’t extricate yourself: people disappear on this route all the time. How far is the trek to Everest Base Camp? Distance Lukla to Everest base camp: 38.58 miles or 62 Kilometers 8 to 9 days walk in and a 3 to 4 day walk out. Walk in is slower due to the extra days needed to allow a persons body to adjust to the new altitudes. Package tour with a Nepal Tours. This is about the second most popular way to arrange a trek to Everest Base Camp. Prices range per person from USD $1,400 up to $1,700 for an average 12 – 16 day trek. Price depends on your service and accommodation in the Mountain areas, if you stay luxury accommodation in the mountain the price will goes high but at in a normal accommodation the price will be the same as above. When you arrive at the airport, Nepal Tours representative will be there to pick you up and bring you to the hotel. Depending on when you arrive, you’ll go through an orientation on either day one or day two. Our adventure starts with a short flight to Lukla, including breathtaking views of the Himalaya region from the air, and a while-knuckle landing on Lukla’s mountain runway. We’ll meet the rest of our crew at Lukla, and begin hiking up the Dudh Koshi valley on the way to Phakding. Namche supports a host of shops, lodges and tea houses, and is an excellent place to grow used to moving around in the thin air nearly 3500m above sea level. 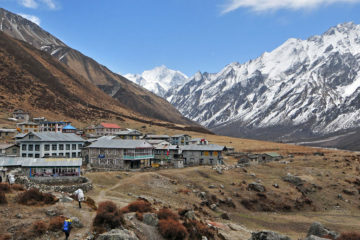 To help the process along, we’ll organise a trek to the Everest View Hotel (at 3880 metres). You can enjoy lunch with a world class view of the mountain on their patio. We’ll set off very early on day ten to make for the peak of Kala Pattar, and one of the most awe-inspiring views in the region. The land stretches out before us, from Everest itself to the Khumbu icefield. After a pause for rest, lunch and photographs, we begin the descent back to Dingboche. We’ll be following the river again for some time, then making our way to Tengboche through rhododendron and birch woods. After Tengboche, we’ll cross the Dudh Koshi and return to Namche. Our last day of trekking follows the Dudh Koshi valley into Lukla. At Lukla there is usually a farewell party for everyone – climbers, guides and porters alike – celebrating another successful trek. Be sure to try the traditional Sherpa dances and sample some chang while you’re at it. It’s a bit like beer, but served hot. Such a fantastic trip that I highly recommend! Couldn’t have asked for better guides and a better group of people to travel to Everest Base Camp with!. A challenging but incredibly rewarding trip with constantly changing, awe inspiring scenery. The better prepared you are physically, emotionally and organizationally the more you will enjoy your time in the mountains. Hi, A Wonderful Everest Base Camp trek, Well organized by RB and Kulendra from Nepal Tours. Our guide were wonderful and excellent help. Thank you to all for making our trip so memorable. I would highly recommend the use of Nepal Tours to anyone want to Visit Nepal. My daughter, my son, and I did the 14 days EBC trekking in December. It was just wonderful. It does get cold at night but during the day, with sun, it’s actually very pleasant. December seems to be a good month as you enjoy the trails and teahouses without being crowded, and it’s before the rainy season. We started hiking Dec 14 and finished by the 27th, which was right before the Christmas crowd showing up. We did Kalapathar the night before EBC for sunset, which is the best time to do it as you would have the most spectacular views of the Everest summit both before and during sunset. The company we used in Nepal was Nepal Tours. They were well organized and accommodating. This was my first trip with Nepal Tours and I was very impressed with the efficient and hassle free organising of the 14 days Everest Base Camp Trek. I would definitely recommend this trip to anyone who is contemplating it as I certainly found it to be extremely enjoyable and have come home with plenty of great memories from it.